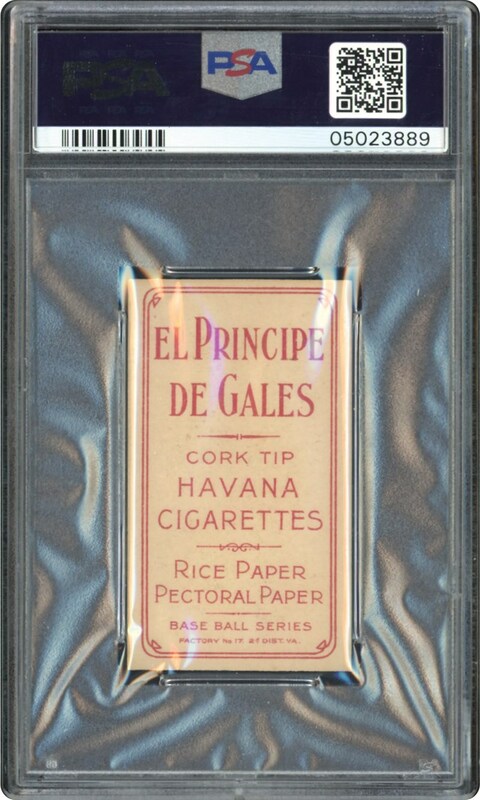 Lot # 12: 1909 T206 Bill Bradley “w/Bat” El Principe De Gales (PSA NM/MT 8) - “1 of 1 & HIGHEST GRADED EL PRINCIPE DE GALES BRADLEY! 1909 T206 Bill Bradley "w/Bat" El Principe De Gales (PSA NM/MT 8) - "1 of 1 & HIGHEST GRADED EL PRINCIPE DE GALES BRADLEY! The finest El Pricipe De Gales Bill Bradley w/Bat T206 on the planet, this remarkable PSA NM/MT 8 EPDG offering proudly stands alone as the "best of the rest" on the illustrious PSA "pop" chart! Indeed, this EPDG Bradley "holding bat" offering not only stands alone at the top of the charts; its lofty assessment has not been surpassed by a single other Bill Bradley w/Bat subject, regardless of its back advertisement". 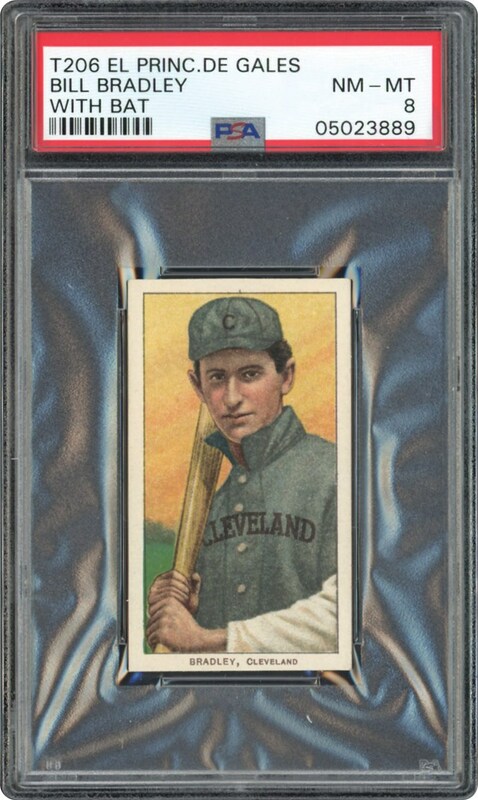 A superb "turn of the 20th century" 3rd baseman for the Cleveland club, Bradley's sensational representation on this brilliant keepsake is highlighted by a virtually "dead-on" 50/50 centered image of the stellar 3rd sacker as he grips his period style lumber. Dazzling white borders, pack-fresh surfaces, pinpoint corners and a rich red EPDG ad verso complete this timeless marvel that has rightfully earned bragging rights as the finest T206 EPDG Bradley of its kind!